Royal Caribbean's Allure of the Seas, the largest cruise ship in the world, has been quietly dealing with propulsion issues that is limiting the ship's top speed. Cruise Critic first reported that over the last three weeks, the ship has had, "a significant reduction in the ship's speed". The result of which has been less time at each port of call the ship makes. 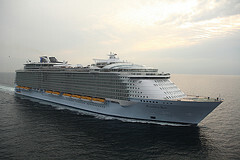 Royal Caribbean spokeswoman Cynthia Martinez described the situation as, "Allure of the Seas currently has a small restriction on her top speed. All equipment is fully operational, and there is no impact on the maneuverability of the ship or on the safety of our guests and crew." The impact on guests has been less time at each port and in some cases cancelled shore excursions due to not having enough time to complete it. It's not clear what exact issue is causing the slower ship speed, but it has not been a big enough problem to cancel any sailings or affect the onboard guest experience.